Christof Heyns is professor of human rights law at the University of Pretoria and a member of the United Nations Human Rights Committee. He teaches human rights law in the Masters’ programme at Oxford University, is an adjunct professor at the American University in Washington DC, and was a visiting professor at the University of Geneva in 2016. 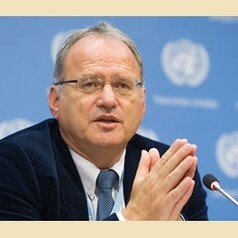 Heyns was UN Special Rapporteur on extrajudicial, summary or arbitrary executions 2010 – 2016. During 2016 he chaired the UN Independent Investigation on Burundi. He holds degrees in law and philosophy from the Universities of Pretoria, the Witwatersrand and Yale Law School. He has been a Humboldt Fellow at the Max Planck Institute in Heidelberg and a Fulbright Fellow at Harvard Law School.